Exile, Writer, Soldier, Spy: Jorge Semprún. Biography of Jorge Semprún (US edition). Arcade. 2018. 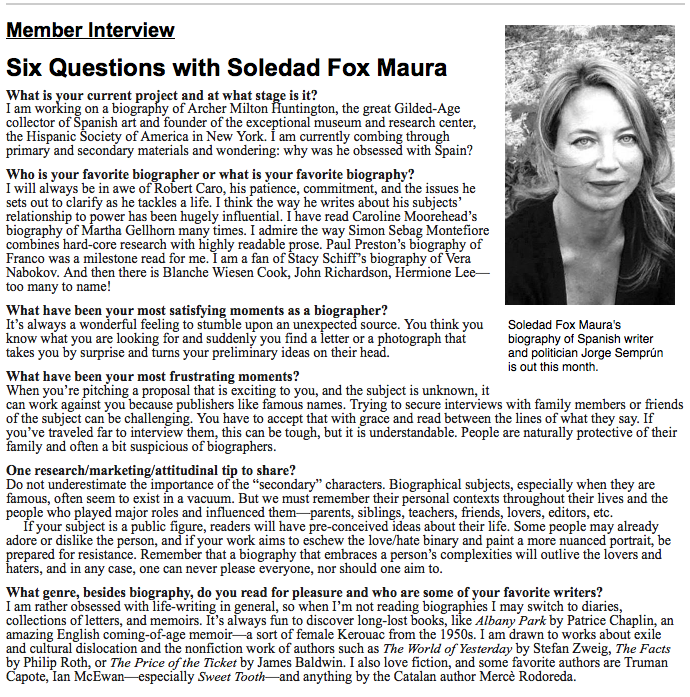 Member Interview, The Biographer’s Craft, July 2018. “‘Exile, Writer, Soldier, Spy’ Review: A Man of Many Lives.” The Wall Street Journal, June 29, 2018. “Remembering Buchenwald survivor Jorge Semprún, a key witness to the 20th century.” Salon.com, July 1, 2018. 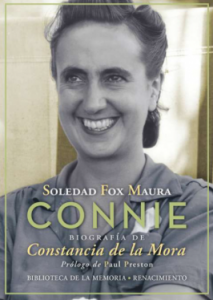 Connie (new Spanish edition of the biography of Constancia de la Mora). Editorial Renacimiento, Sevilla. 2017. English Radio Interview on Radio Exterior de España about Constancia de la Mora: A Spanish Woman in Love and War. Lecture on “Constancia de la Mora: Vida y olvido de una mujer española”. Hosted by the Círculo Orellana series “Mujeres por descubrir” and the Instituto Cervantes. Flaubert and Don Quijote: The Influence of Cervantes on Madame Bovary, Sussex Academic Press, 2008. http://www.sussex-academic.co.uk/sa/titles/literary_criticism/Fox.htm Spanish edition forthcoming with Editorial Renacimiento, 2017. “Constancia de la Mora: Vida y olvido de una mujer española”. Hosted by the Círculo Orellana series “Mujeres por descubrir” and the Instituto Cervantes. “Constancia de la Mora. Vida y olvido de una mujer española” in Mujeres de la República, Lidia Falcón O’Neill, ed. Madrid: Vindicación Feminista, 2018. “Jorge Semprún and the Holocaust” in Spain, the Holocaust and World War II, edited by Sara Brenneis and Gina Herrmann. Publisher TBA. Lecture on Biography & Jorge Semprún, Colgate University, April 8, 2019. Presentation of Exile, Writer, Soldier, Spy with Professor Vincent Crapanzano, Journalist Jane Kramer, and Editor Jeannette Seaver at Albertine Bookshop (part of the Cultural Services of the French Embassy), New York. February, 2019. Talk on Exile, Writer, Soldier, Spy at the Tamiment Library & Robert F. Wagner Labor Archives, New York University. February, 2019. Presentations and signings of Exile, Writer, Soldier, Spy at The Lenox Bookstore (July, Lenox, MA), The Williams Bookstore ( September, Williamstown, MA), Northshire Bookstore (October, Manchester, VT). 2018. “The Art of Biography” at the Centro Internacional de Estudios Antonio Machado, Fundación Duques de Soria, Soria, Spain. July, 2018. Laudatio for Masha Gessen, XVI Journalism Prize, The Fundación Diario Madrid, June, 2018. Presentation of Connie at the Instituto Cervantes (Madrid). Event hosted and organized by the Círculo Orellana within their cycle “Españolas por descubrir” (“Unknown Spanish Women”). January, 2018. Presentation of Ida y vuelta: La vida de Jorge Semprún at the Americas Society (New York) with the Spanish Consul for Culture. October, 2017. Member of roundtable presented by Professor Robert Véguez with Laura García Lorca, Samuel Guarnaccia, Tana Centeno, and Professor Juan Camacho. Middlebury Spanish School Centennial, Middlebury College. July 18, 2017. Tuesday Tea book presentation of Jorge Semprún: The Spaniard who Survived the Nazis and Conquered Paris, Williams College, April 2017. Jorge Semprún: L’écriture et la vie: Paris: Flammarion, Grandes Biographies, 2017. Presented with Juan Manuel Bonet and Georges-Henri Soutou, L’institut Cervantes, Paris. January, 2017. “Jorge Semprún: Biography of an autobiographer”, Department of Hispanic Studies, Trinity College, University of Dublin. October, 2016. “Women in the Spanish Civil War”, Commemorative Lecture Series, 80th Anniversary of the outbreak of the Spanish Civil War. Friends of the International Brigades in Ireland. Dublin. October, 2016. “Jorge Semprún and the Prado Museum”, Talk for Clark Members. New York, October 2016. Presentations of Ida y vuelta: la vida de Jorge Semprún. Debate, Penguin Random House. 2016. Fundacíón Giner de los Ríos with Felipe González, Miguel Aguilar, and Claudio Aranzadi. Madrid, May, 2016. Casa Sefarad Israel with Andrea Aguilar and Joaquín Almunia. Madrid, June, 2016. La Central, with Pere Portabella, Manel Manchón, and Albert Solé. Barcelona, July, 2016. “Biography and its Discontents”, Williams College Faculty Lecture Series, 2015. “Jorge Semprún: El arte de la autobiografía”. Congreso Internacional: Epistolarios, memorias, y diarios en la cultura Española del medio siglo. Historia e intimidad. Facultad de Filosofía y Letras, Universidad Autónoma, Madrid. 2016. “Querido Dos: Letters from the family of José Robles to John Dos Passos.” Second Biennial John Dos Passos Society Conference. Universidad Alfonso X El Sabio, Madrid. 2016. Jorge Semprún: Memory’s Long Voyage by Daniela Omlor, in The Journal of Spanish Cultural Studies, Number 19.2, February 2017. Ejercicios de Supervivencia by Jorge Semprún in Ahora Semanal, March 18, 2016.
Review essay of Selected Poems of Luis de Góngora. Edited and translated by John Dent-Young. Chicago: University of Chicago Press. The Disinherited: The Exiles who Created Spanish Culture by Henry Kamen. In The Times Higher Education Supplement (London: Allen Lane, 2007). Berkeley, Los Angeles, London: University of California Press, 2003. “Querido Dos: The friendship of John Dos Passos with the family of José Robles”, John Dos Passos Society Newsletter, June, 2017. Fulbright Scholar Program, Washington, DC, and the Selection Committee for the Fulbright Commission of Spain, 2010-2011.